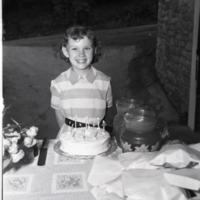 This image is of a young girl posed behind her birthday cake. 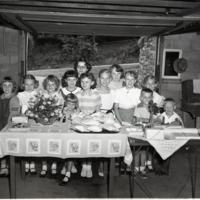 The original envelope was labeled "Norris Birthday Party, 6-18-54" and had been filed under "Parties." 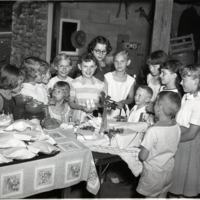 This image is of a young girl opening birthday presents in front of her friends. The original envelope was labeled "Norris Birthday Party, 6-18-54" and had been filed under "Parties." 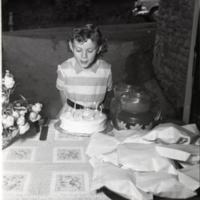 This image is of a young girl blowing out the candles on her birthday cake. The original envelope was labeled "Norris Birthday Party, 6-18-54" and had been filed under "Parties." 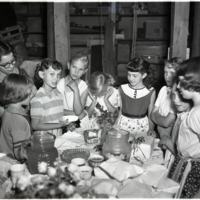 This image is of several children gathered around two tables in a garage for a birthday party. The original envelope was labeled "Norris Birthday Party, 6-18-54" and had been filed under "Parties." 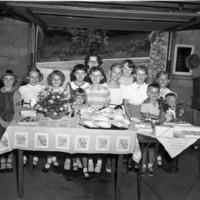 This image is of several young girls in party clothes gathered around a low table laden with birthday presents. The original envelope was labeled "Norris Birthday Party, 6-18-54" and had been filed under "Parties." 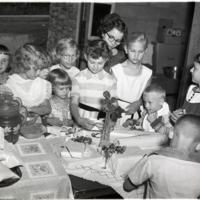 This image is of J.B. Hodges holding a toy while a woman cuts his cake at his fifth birthday party. The original envelope was labeled "J.B. Hodges 5th Birthday, 9-17-54" and had been filed under "Parties." 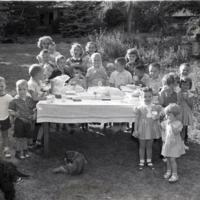 This image is of J.B. Hodges and several of his friends at his fifth birthday party. 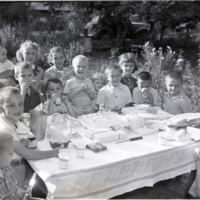 The original envelope was labeled "J.B. Hodges 5th Birthday, 9-17-54" and had been filed under "Parties."